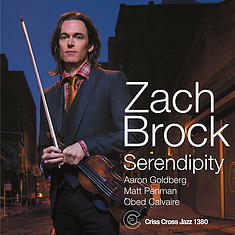 Violin virtuoso Zach Brock's third session is, like its predecessors, Almost Never Was (Criss 1349) and Purple Sounds (Criss 1366), a tour de force of modern swing expression. Joined by New York A-listers Aaron Goldberg (piano), Matt Penman (bass) and Obed Calvaire (drums), Brock addresses a stylistically varied program, showcasing his command of a broad timeline of violin styles that he refracts into his own individualistic argot. The repertoire includes Jean-Luc Ponty ( Sunday Walk ), Charlie Parker ( Segment ), the American Songbook (the Leonard Bernstein ballad Some Other Time ), and several substantial originals.